A tornado touched down in a field slightly outside of the "old Kroger's" in my hometown of Piqua, Ohio. What kind of damage did the tornado bring? Gremlins. The tornado delivered gremlins. Yes, those little green creepy critters. And I spent the entire rest of the dream trying to protect myself and my family from the tornado gremlins. I've been petrified of these little guys as long as I can remember, yet I love watching those movies. I used to think that gremlins would reach through the slots in open-staircases and grab my ankles with their bony, clawed fingers. But in my dream, they just destroyed the grocery store, particularly enjoying destroying milk jugs and other items in the refrigerator/freezer section. My ankles are safe. I loved the Gremlins movies, but I can see how you'd be frightened of the green menaces. My cousin had a little Gizmo action figure and an above-ground pool. One day I accidentally dropped the Gizmo into the water and waited for the scary green gremilns to show up. 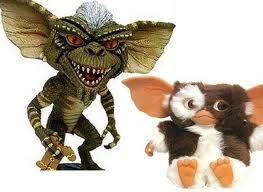 I used to be afraid that gremlins would grab my ankles if I jumped out of bed to turn off the light in my bedroom. And by "used to be", I mean up until about 5 years ago.